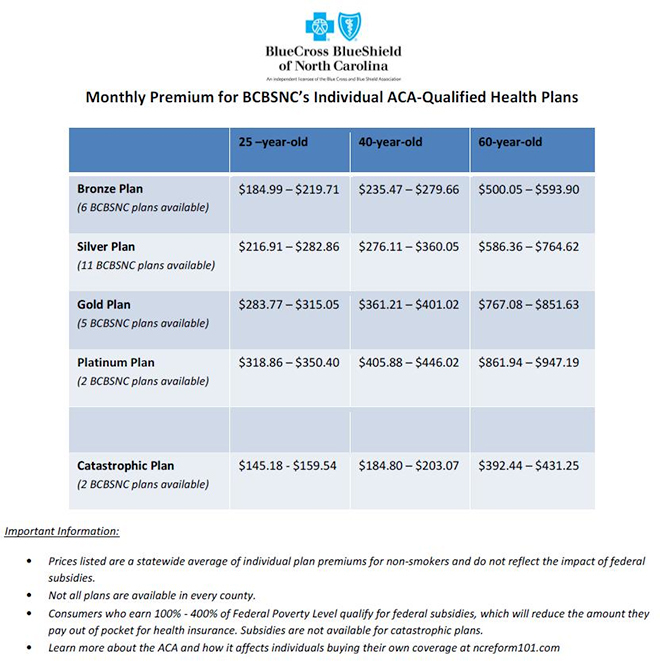 CHAPEL HILL, N.C. – Blue Cross and Blue Shield of North Carolina (BCBSNC), the only insurer in the state that has applied to serve all 100 North Carolina counties on the Affordable Care Act’s (ACA) health insurance Exchange, today announced pricing information for its ACA-compatible products for individuals. Consumers can visit bcbsnc.com/bluemap for a summary of how the ACA might impact them, including whether they might qualify for a subsidy. Blue Map will be available online until Sept. 15. Consumers can also speak directly to BCBSNC representatives at one of many ACA informational events being held across the state. Click here for a list of these events. “Health reform is complicated, and it affects everyone differently. We want to help North Carolina consumers understand how they will be affected and provide information to support them in making the best decision for their personal situation,” said Barbara Morales Burke, BCBSNC vice president of health policy and chief compliance officer. ACA health plans generally offer richer benefits than plans many BCBSNC customers choose today. In addition to requiring richer benefits, the ACA eliminates the use of gender or health status in setting premiums. Consumers may begin shopping for coverage – and can learn exactly how much subsidy they might receive – by visiting the Exchange when it opens. For comprehensive information about health reform, visit nchealthreform.com. 1 To qualify for a catastrophic plan, consumers must be under 30 years old OR get a "hardship exemption" because the Exchange determined that they are unable to afford health coverage. 2 In 2013, the Federal Poverty Level is defined as income of $11,490 annually for an individual or $23,550 annually for a family of four.